There are many publishers of online car repair manuals. It is difficult to choose which one is the best because you may not find enough reviews to use as a reference. I picked four major publishers here, Alldatadiy, Chiltondiy, HanyensOnline, and Mitchell1diy. Something in common is that they all require a subscription and internet access. First off, let’s take a look at prices and terms of subscriptions on each publisher. All of them have a 1-year subscription, and those prices are almost the same. I guess it’s the most popular term for most people to subscribe an online manual. Long terms (4 or 5 years) are available on Alldatadiy and Mitchell1diy, but they may be too long. You never know what will happen to your car next 4 or 5 years. You might get an accident or simply change to a different car. On the other hand, Chiltondiy and Mitchell1diy have short terms (30 or 31 days) subscriptions. This may be convenient for those who surely don’t need the manual for more than a month. But, I believe one month is too short because the car problems don’t happen conveniently within a month. And, take a look at the prices of Chiltondiy. The difference between 30-days and 1-year is only $5. In addition to all basic information above, Alldatadiy has a special price for additional vehicles or renewal, $19.99 for 1-year and $34.95 for 5-year on each additional vehicle or renewal. And, you can change your subscription vehicle one time during 1-year or 5-year subscription. This is a very friendly option to subscribers. I wish other publishers had the same option as well. HaynesOnline mentions a discount for a subscription renewal on their website, but it doesn’t show exactly how much. So, Alldatadiy is the only publisher that offers a discount when you subscribe to multiple manuals at the same time. If you need multiple manuals of 1-year subscriptions for 2 or more different cars, you will pay $29.95 for the first vehicle and $19.95 for each additional vehicle. If it is 5 years subscription, the price will be $44.95 for the first vehicle and $29.95 for each additional vehicle. For example, you have 4 friends who have different cars and need the manuals. When you purchase 1-year subscription together, the price will be $29.95 + $19.95 x 4 =$109.75 in total, and it is divided by 5. Each of you pays only $21.95. All of you get approximately 30% discount. The more you purchase, the more discount you will get!. This is a huge advantage over other publishers. At the time of writing, the list price of Haynes online manual is $29.99, and a sale price is $19.99. But, customer representative confirmed that $19.99 is now a regular price, and also mentioned that renewals costs only $9.99. Next, let’s see vehicle coverage of each publisher. I can’t upload all coverage here on this website, so you should visit each website of online manuals to see if they have your vehicle’s manual. Alldatadiy: Most domestic and imported vehicles sold in the U.S. in 1982 and later except for BMW and Mini. Pre-1982 vehicles are not covered. Chiltondiy: Most domestic and imported vehicles sold in the U.S. in 1940 and later. HaynesOnline: Most domestic and imported vehicles sold in the U.S. in 1949 and later. Note that older vehicles are printed manuals only. 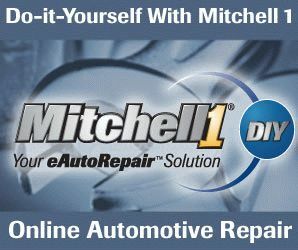 Mitchell1diy: Most domestic and imported vehicles sold in the U.S. in 1983 and later. Notably, Chiltondiy covers old vehicles since 1940. Needless to say, the volume of contents is a little because automotive technology was primitive back then. HaynesOnline has older vehicles manuals, but they are not online but printed versions. Mitchell1diy sells DVD, titled VINTAGE for old vehicles at the price of $150. VINTAGE covers almost all domestic and import vehicles sold in the U.S. between the mid-1960s and 1982. All publishers but Alldatadiy have comprehensive coverage between 1983 and later. Alldatadiy has no manuals for BMW and Mini due to manufacturers requests. Lastly, let’s compare the contents of manuals on all publisher. Alldatadiy: I can’t find any lack of information. It is quite comprehensive. But, there are a few things that I want it to be improved. First, a search function is limited to the results on components. Even if you type trouble codes like P0122, you will get no result. Second, the access to the wiring diagram of each system or component is not consistent. For wiring diagrams for some components, you can find them in the same page along with links of Part and Labor, Service and Repair, etc. And, for some others, you can’t find it there. So, at first, I thought a lot of wiring diagrams were missing. But, rest assured, just go back to the home screen and click Diagrams on the right of the screen. You can access all the wiring diagrams from there. Lastly, when I see the manual on a smartphone, pinch-to-zoom works, but images are blurry. So you have to click Zoom button to enlarge. If they were clear enough for you to see by just using pinch-to-zoom instead of clicking Zoom button, you would read the manual much faster and more easily on mobile devices. Click here to read a full review. Chitondiy: I can’t find any lack of information. It is quite comprehensive. It has the Play button on every page that allows you to listen to robotic narration reading the description on the page. For me, it’s useless, but it might be a great help for some people. Navigation is perfect. I’m sure that you can reach specific information easily without being lost. The search function does its job perfectly as well. Whatever you type in the search box, you will get a result with a list of links to pages that contents the word you just typed. Illustrations along with Removal and Installation are vivid. Even on mobile devices, you can see them clear with pinch-to-zoom. The only thing I don’t like is I have to download every time I see wiring diagrams on Android devices. It may be the setting for just opening instead of download, but I haven’t found that configuration yet. Chrome on Windows and Safari on iPhone open wiring diagrams on a new tab, which is the way I prefer. Click here to read a full review. HaynesOnline: I can’t find any lack of information. It is quite comprehensive. The manual is very neat and clear. It’s comfortable to look at it on both a computer and mobile device. There are lots of pictures and illustrations along with descriptions, and they are high quality. All of them are clickable to enlarge, but you don’t have to do that when you are using a smartphone, tablet, or touchscreen computer. They are clear enough for you to see them by just using pinch-to-zoom. However, you may get problems when you open wiring diagrams in full screen. It’s successful on Internet Explorer and Safari, but it’s not on Chrome on both Windows and Android. One more thing, internal links are not perfect. Many of them don’t take you to specific pages. They take you to the top of the Chapter, instead. Then, you have to look for a page or Section in that Chapter. Click here to read a full review. Mitchell1diy: Wiring diagrams are comprehensive. They are clear to see and well-organized. But, unlike the professional version of Mitchell manuals, they are not color-coded. It lacks some basic information about removal and installation. Illustrations don’t come along with descriptions. Instead, there are links to illustrations. It’s kind of bothersome you have to click every time you want to see the illustrations. Navigation is terrible. It’s tough to use the manual on mobile devices, too. Click here to read a full review. When it comes to prices of 1-year subscriptions, Alldatadiy is the best of all. It’s the only one to provide an option to change a vehicle once and discount on additional vehicles or renewal. HaynesOnline may offer a discount for renewal, and they are often on sale or some promotions. So, you should check their prices before buying. HaynesOnline has the best design. Chiltondiy is almost the same design and structure as HaynesOnline, but HaynesOnline is much clearer and easier to see than any others. On mobile devices, for the same reason, HaynesOnline is the best. However, speaking of navigation, Chiltondiy is the best. HaynesOnline is the second because as I mentioned above, some internal links don’t go to the specific pages. The volume and quality of contents are almost the same among Alldatadiy, HaynesOnline, and Chiltondiy. And, I can’t find anything good about Mitchell1diy.